The chart they provide on the website is very accurate and helpful in choosing which BB is right for you. I used it to pick the two that I thought would be the best fir for me and they were right on. The Color "Natural Beige" is the shade listed for almost all of the BB's. It will suit skintone's as light as mine (MAC NW15) as well as medium. I haven't put these on darker skintones so I can't attest to how they will work. From the swatches they do appear dark, but keep in mind BB's adjust to skin tone after application. 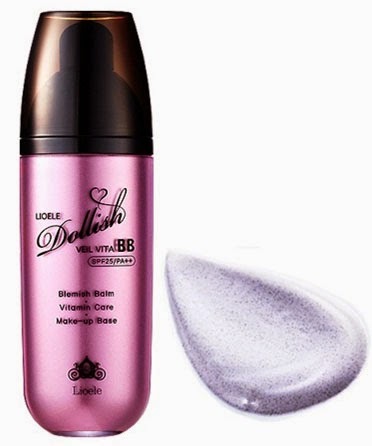 Also, the white violet of Dollish doesn't look that way once on the skin, it's like an invisible foundation and ideal for porcelain complexion's. This is Lioele's best selling BB Cream and was also my favorite of the line. BYS was the most full coverage of all the BB's. I apply it very sparingly, less than 1/2 pump, and still don't have to wear any extra foundation with it. It has the coverage of a medium level foundation and is only a tiny bit darker than my skintone, there's also none of that grey cast that a lot of tinted BB's have. With no heavy feeling it filled in my pores, evened out skin tone, absorbed oil, and left my skin feeling and looking so soft and smooth. It also makes an excellent makeup primer. My concealer and blush stayed set all day even in hot humid weather with only a tad bit of shine appearing by the end of the day. Also worth noting, if like me you can't stand perfume in your cosmetics this one is the least scented. 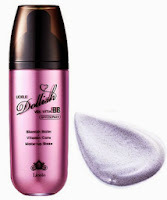 There's no SPF in this BB which I love, it's perfect for indoor/night and flash photography use. For the day apply it over my regular suncreen. I've been using Beyond the Solution every day in place of my foundation and I just LOVE it. Only second favorite to BYS is the Dollish BB in Gorgeous Purple. This cream comes out looking like a violet sunscreen but sinks in to the skin like an invisible foundation. Skintone is brighter and any discolorations are neutralized and lightly concealed. While BYS gave my skin a hint of color, Dollish made my complexion look slightly paled out, actually "Dollish" is the perfect word to describe it. 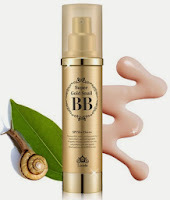 If you are very fair and find BB's turn your skin an unpleasant shade of orange, check this one out. It brightens light complexion's up to that delicate snow white kinda pale. I can't really decide on what coverage this gave because it just made my skin look flawless and I only used a tiny bit of foundation so that it didn't look like super pale. This also comes in Green if you need to neutralize redness in your complexion. SPF 30. Triple the Solution BB Cream is a three-in-one makeup and skincare formula with whitening, wrinkle care and sun protection. The natural healthy yogurt powder and hyaluronic acid in this anti-aging day cream moisturizes your skin. Formulated with tangerine and strawberry extracts that whitens and lightens the skin tone over time and helps to prevent the appearance of fine lines, wrinkles, blemishes and freckles. 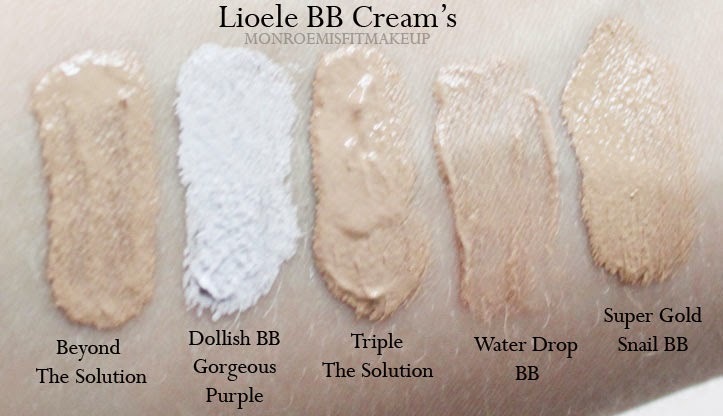 The non-greasy formula of the Lioele Triple The Solution BB Cream leaves your skin looking fresh and vibrant. This is a lot like the BYS, except it contains an SPF 30, it's a bit darker than my skintone so I plan on using this in the summer when my skin gets a little tan. It protects your skin while also lightening freckles which I get when my sunscreen fails me, acts as an anti-aging moisturizer, pore pefector, foundation, SPF, and works to improve your skin tone. A perfect all in one product. 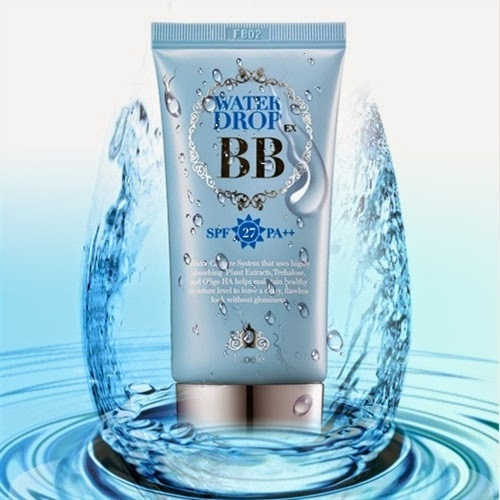 Water Drop BB Cream is a multifunctional product containing a unique water droplet formula which highly moisturizes the skin with light natural beige coverage and is recommended for those with dry skin. This product is so cool! Once applied little "water droplets" form on your face before you smooth them in. It's one of the most hydrating BB's in the line and would be excellent for dry skin or if you need a soothing product say after a sunburn. SPF 27. Unlike the others that matify your skin to a smooth surface, this one is sheer and add's more of a healthy moisturized glow with out looking greasy. Super Gold Snail is one of the pricier BB's, it contains gold and 10% snail slime extract filtrate that soothes, regenerates, and heals skin. Okay that sounds soo freakin gross right! I had a hard time wanting to use this but I knew the ingredients were likely minimal. The unique formula has snail filtrate which helps to promote the natural healing process and dissolves dying cells. It's also the highest SPF in the BB line at SPF 50. This one has medium coverage with a moisturizing feel and finish. Snail Gold was my least favorite only because it has a rather strong floral scent. With the skin healing properties it would likely be good for those with dry skin from acne and/or acne medications which can dry out the skin. 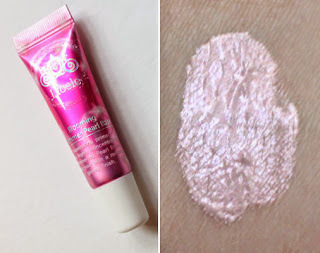 This isn't a BB, but I wanted to include it anyway because it is a gorgeous cream highlighter. The formula contains pearl powder that transform dull skin to glossy, bright, shiny and glowing skin. This highlighter is a beautiful pale pink shimmer, very similar to Smashbox Skinlight's. It can be applied on the highlight points of the face or lightly mixed with their other BB's and foundations. The shimmer reflects catch the light beautifully with out being garish or glittery, just glowy. Looks lovely mixed with moisturizer on the body too. 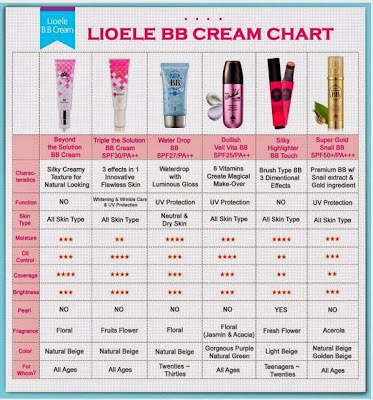 Don't know which Lioele BB to try first? Get the Special Miniatures Set ($16.80), it contains 4 of their best selling products: The set includes miniature (5ml) of the following: Lioele Fresh Sun Screen, Lioele Blooming Shimmer Pearl Base, Lioele Beyond the Solution BB Cream, and Lioele Water Drop BB Cream. You can get at least 2-3 weeks of application from these, and they're perfect for traveling. Or try some samples first. 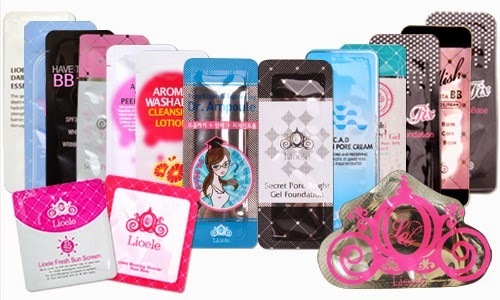 Lioele offers two free samples with every order and they also sell sample packet sachet's. While all of these bb's were super nice, getting a color match can be tricky because of how they adjust differently to each skintone. Trying samples first will let you see which one is right for you before doling out the cash for full sizes. I am so glad I decided to give BB's another shot and try Lioele, it's minimized the amount of face makeup I use while improving my skin and protecting it at the same time. The price's are also excellent. 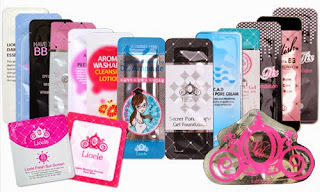 I will be sharing more Makeup and Skin Care product's for Lioele later on, the sheet masks are super luxurious! and a violet face powder? what!? Crazy! If you're looking for a better than any U.S. BB, definitely give one of these a shot, you won't be disappointed :) I am a Korean Makeup convert now. I can't wait to try more!